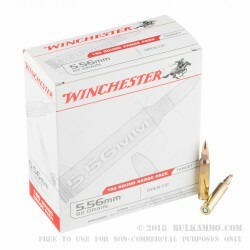 These 5.56mm rounds from Winchester are an excellent choice for plinking, target practice, and tactical drills that will keep your rifle cleaner than standard range loads. This is due to the use of a 62-grain Open Tip projectile which has its base completely shielded by a copper jacket for reduced lead fouling over time. 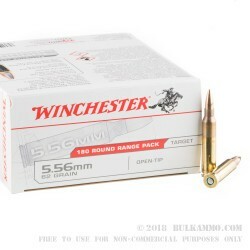 Since it matches M855 "Green Tip" in weight, this bullet is great for establishing an initial zero indoors or against steel targets where penetrating ammo wouldn't be desired. The slighter heavier weight allows for a longer bullet which makes greater contact with barrel rifling for increased spin stability that translates to improved accuracy out to greater distances. To that end, the Open Tip style of construction also aides in precision since it creates a lead core with consistent density and balance while leaving the copper jacket undisturbed with no burrs or imperfections. 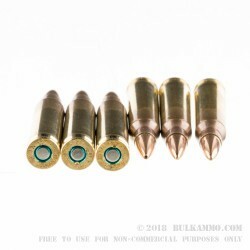 Each bullet is firmly crimped into a brass casing that has been annealed at the neck and shoulder for safe chamber pressures and long reloading life. Winchester goes the extra mile by tri-staking a non-corrosive Boxer primer at the base of the casing in order to prevent the primer from popping out, a rifle-killing malfunction. A dressing of sealant around the primer's circumference prevents moisture from ruining function throughout longterm storage.